I mean take a really good look. 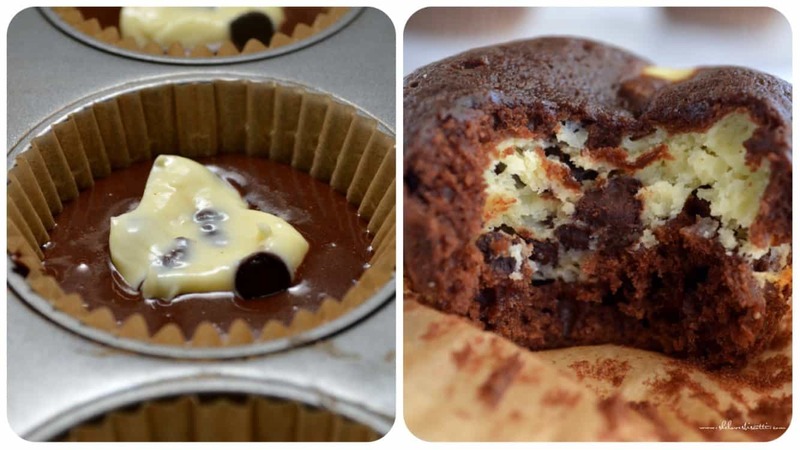 Chocolate on the outside, cream cheese and chocolate chips on the inside. Spoiler alert: that’s what makes them surprise cupcakes! Essentially, this is a chocolate cupcake, but the center is a mixture of cream cheese and chocolate chips. It’s practically like biting into a piece of chocolate cheesecake, but in a cupcake form. I cannot even begin to tell you how many times I’ve made these surprise cupcakes, and for so many different occasions. 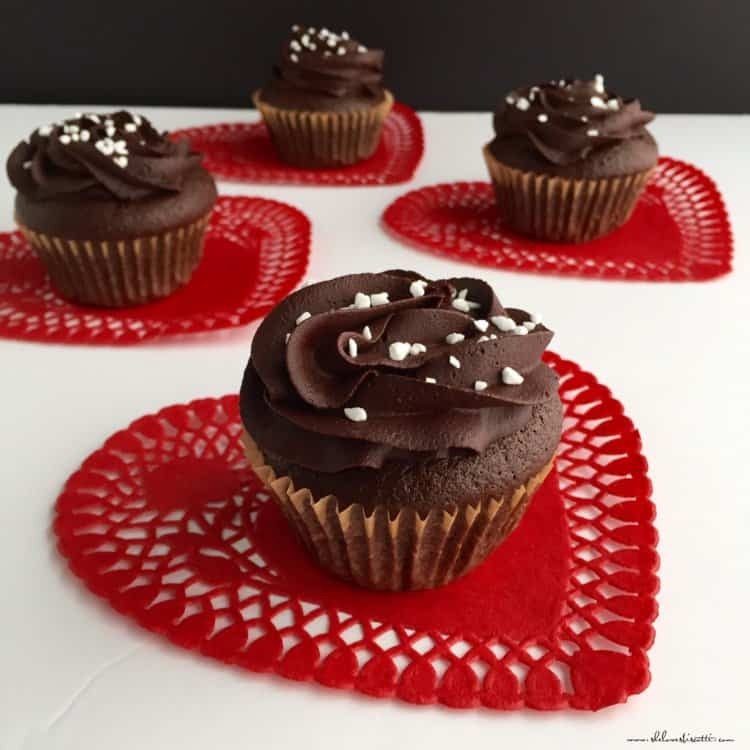 You can dress up these Chocolate Surprise Cupcakes with a ganache frosting and they become a decadent dessert for birthdays, Valentine’s Day, and Christmas. 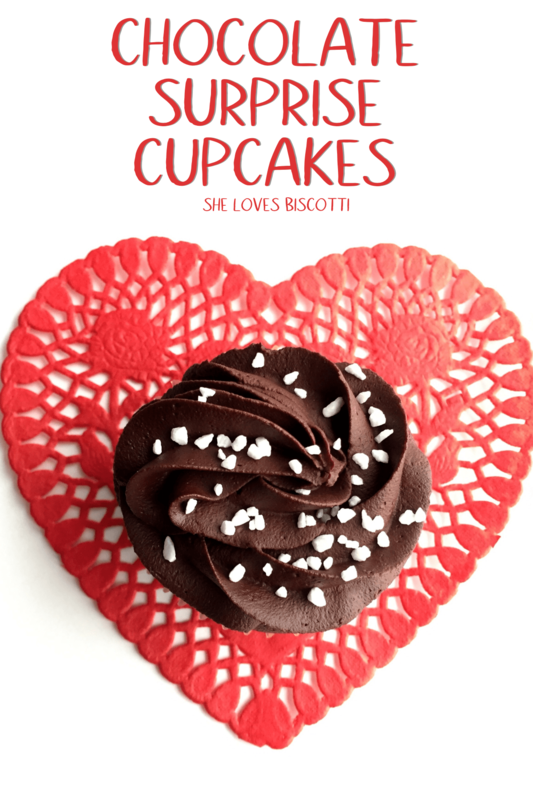 Leave them plain and theyses surprise cupcakes become the best seller for fundraising activities, or a simple Sunday dessert. They are so good that everyone will be asking you for the recipe. Yes, these little surprise cupcakes are really that good! The links on this blog are affiliate links, which means I’ll earn a commission if you use those links (there’s no extra charge to you). In 1983, General Foods published a collection of recipes called: “Baker’s Chocolate Celebration Cookbook“. And of course you know who had to have it. So I sent away my 2.99$ (or whatever ridiculous amount) for postage and handling and 4-6 weeks later I got the cookbook. Good times!!!! The recipe for these surprise cupcakes caught my attention right away. I have made a couple of changes to suit my preferences. I decreased the amount of sugar and chocolate chips; and I like to use a mixture of mint and dark chocolate chips. Mint and dark chocolate…no explanation required ! 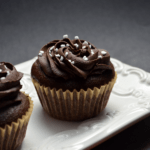 Go ahead and try this recipe for Chocolate Surprise Cupcakes. What changes will you make to call it your own ? 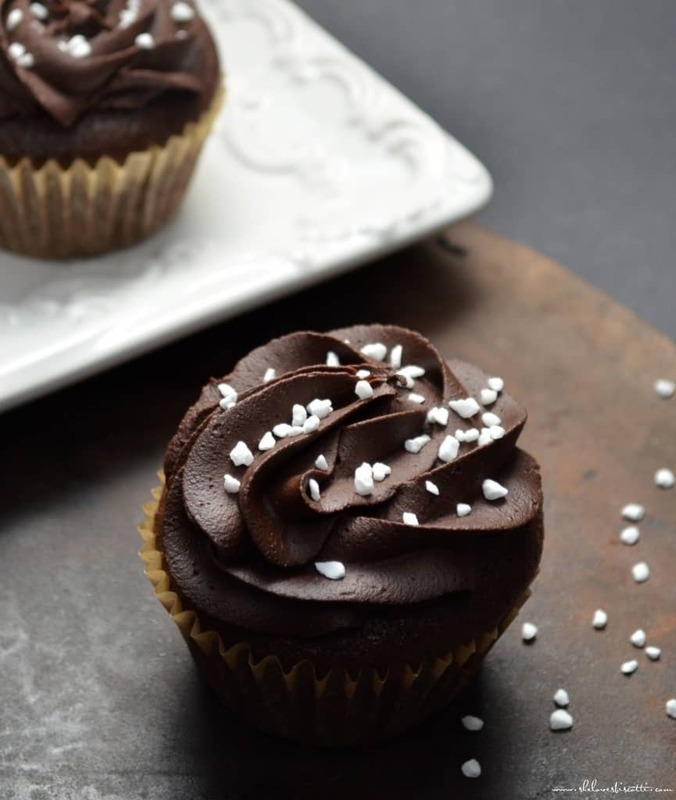 You'll be totally speechless when you bite into these chocolate surprise cupcakes. Spoiler alert: The surprise is the cream cheese-chocolate chip center. Beat together softened cream cheese, egg, and sugar until well blended. Place cupcake liners in muffin tins. In a medium bowl,combine the rest of the ingredients. Beat together with a whisk or fork until smooth (2-3 minutes). Separate 1/2 of the batter equally among the muffin tins. Place 1 tablespoon of the cheese mixture over the batter. Top with the remaining cupcake batter. Bake at 350 F for 30 - 35 minutes. Any kind of chocolate chips can be used. Once cooled you can sprinkle icing sugar over the top or frost with your favourite icing. 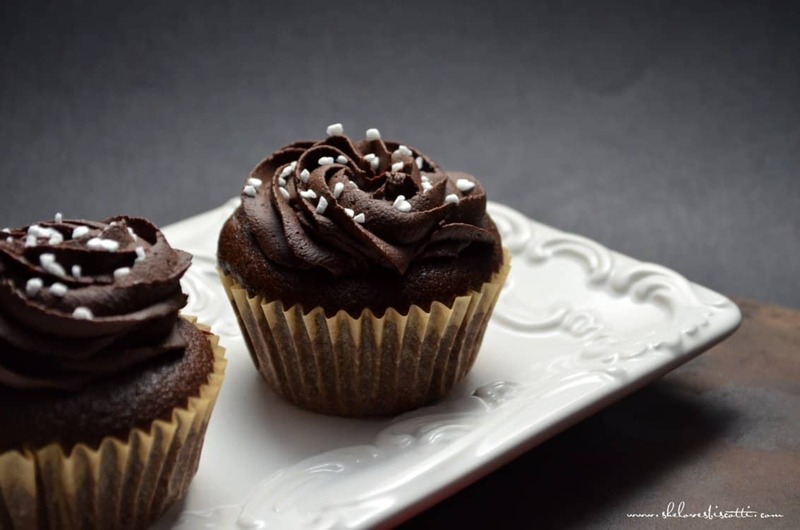 I have iced these cupcakes with the ganache frosting recipe found in simple snacking chocolate banana cake. 2016.01.18 This post has been updated. So, yeah, I’m going to need about a billion of these. They look so decadent! Growing up, one of the five or so cookbooks my family had was the Baker’s Book of Chocolate Riches. Some of my all-time favorite desserts come from there. Maybe I’ll try and track this one down too. So nostalgic! 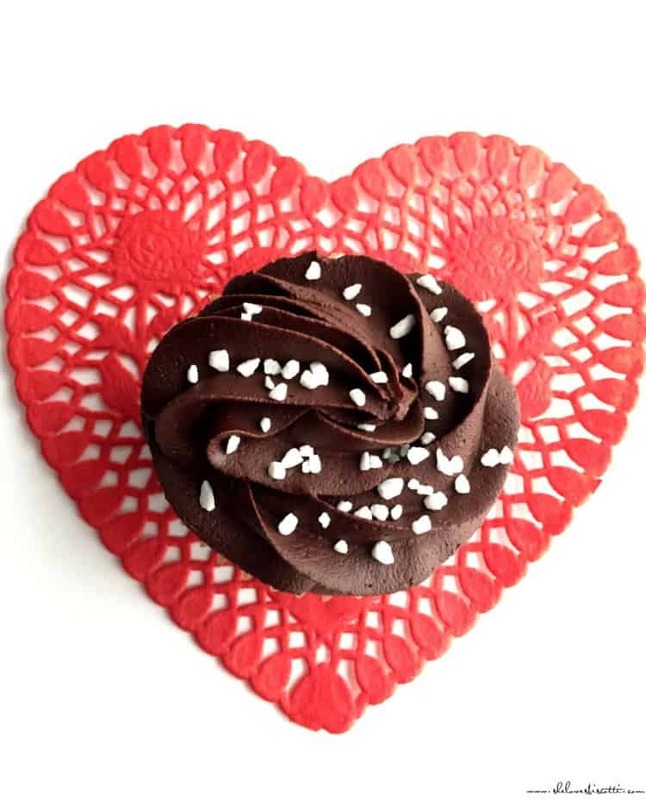 These cupcakes are perfect for Valentine’s Day. The cream cheese chocolate chip center is brilliant! I’ve made these a few times and know they are quite delicious! It’s a recipe that you can turn to time and time again….a classic! Yours are the prettiest I’ve seen Maria! Hi, these cupcakes look delicious, I should make them for my grand-children. These surprise cupcakes are a favorite in my household. Let me know how they turn out.